New to Pittsburgh? 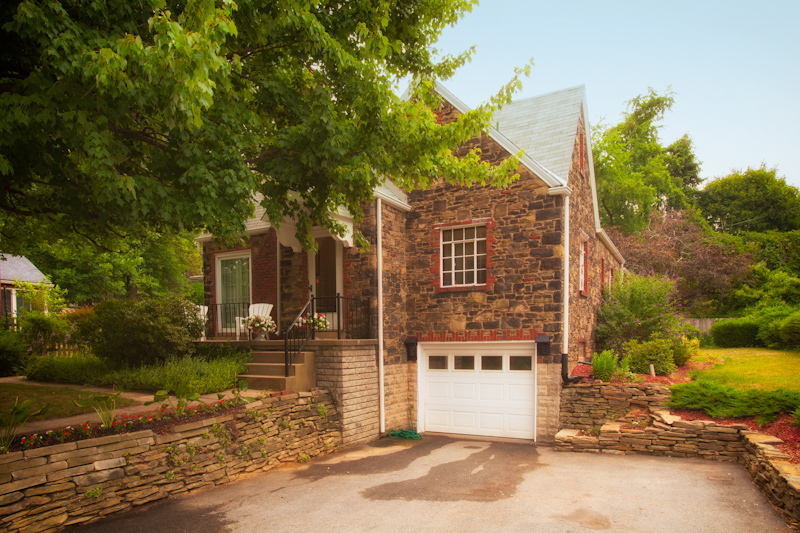 Check out Rosslyn Farms, a premier suburban neighborhood minutes from Downtown, off the Parkway West, where you’ll find this beautiful property. This multi-level house is a fusion of a charming English Manor home and colonial cottage in a bucolic setting. 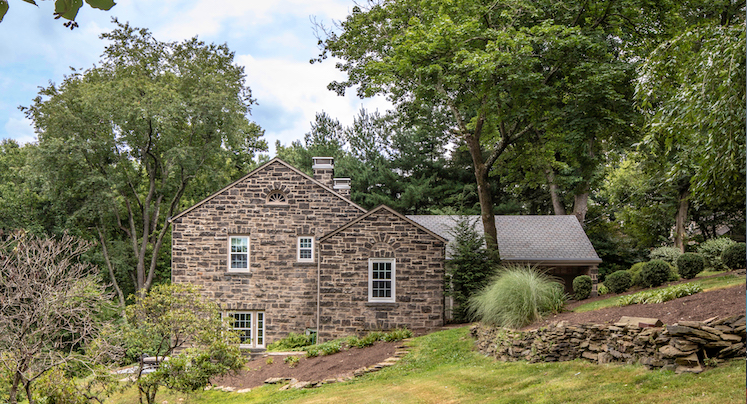 Welcome to 17 Standish Road in the heart of Rosslyn Farms. All photography by Roy Engelbrecht. 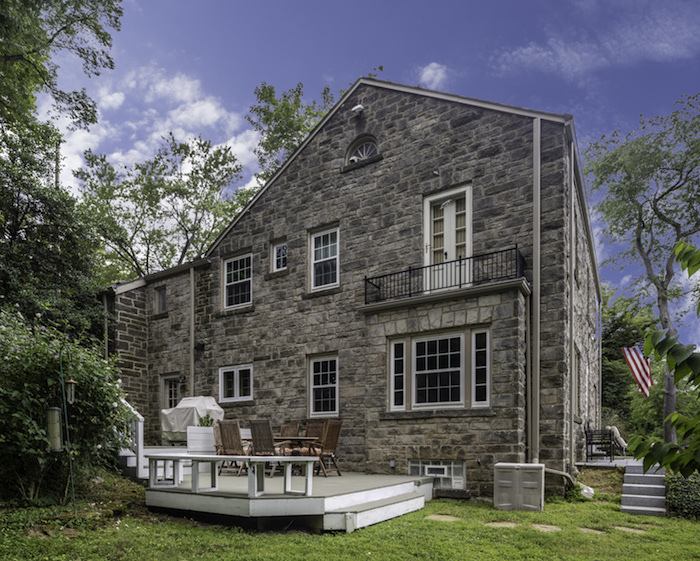 Enjoy the privacy and seclusion of this stately all stone home situated on a terraced property. You will love the private deck — perfect for outdoor entertaining. 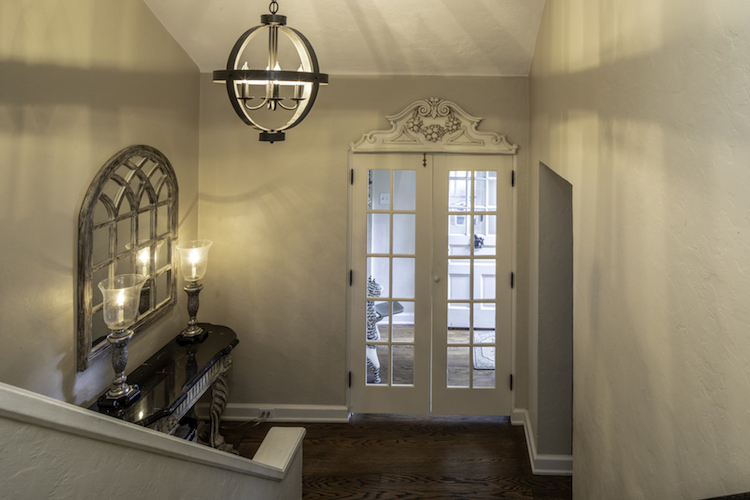 The inviting entry with French doors leads to the charming formal living room with an original stone fireplace adorned by a custom handmade wrought iron screen. The floors are beautiful random plank oak throughout the living room and dining room. 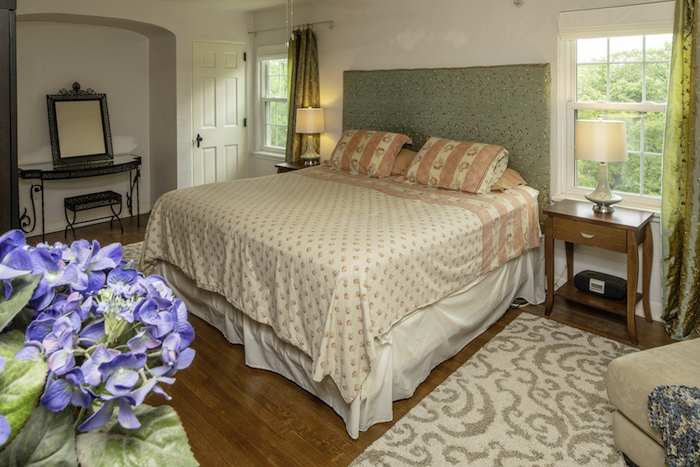 In every room, there’s ample light with park-like views from every window. 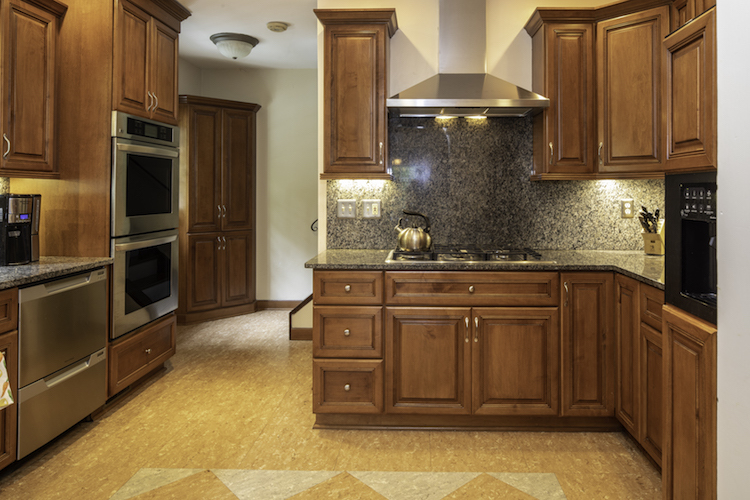 The updated kitchen has a tête-à-tête breakfast area, handsome hardwood cabinetry with stone countertops and backsplash, and stainless steel appliances. The master en-suite features multiple closets, lots of storage and a master bath jet tub shower. 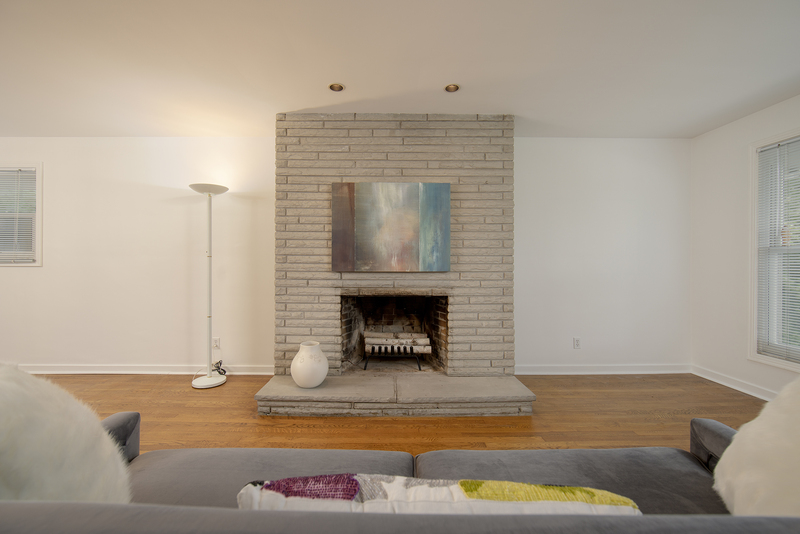 Meticulously updated and lovingly maintained throughout, this home also features a spacious attached double car garage. 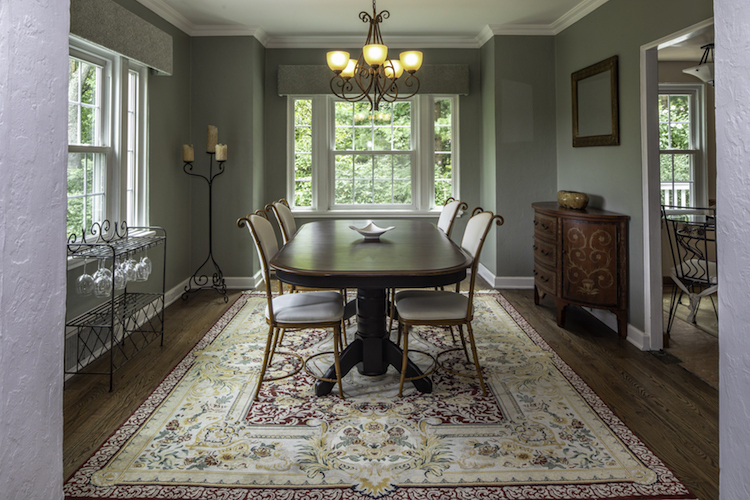 Neill Stouffer of Neill C Stouffer Fine Interiors recently visited the home and was impressed with the charm and exceptional decor throughout the home as well as the meticulous detail. “And the vistas from every window are breathtaking,” said Stouffer. 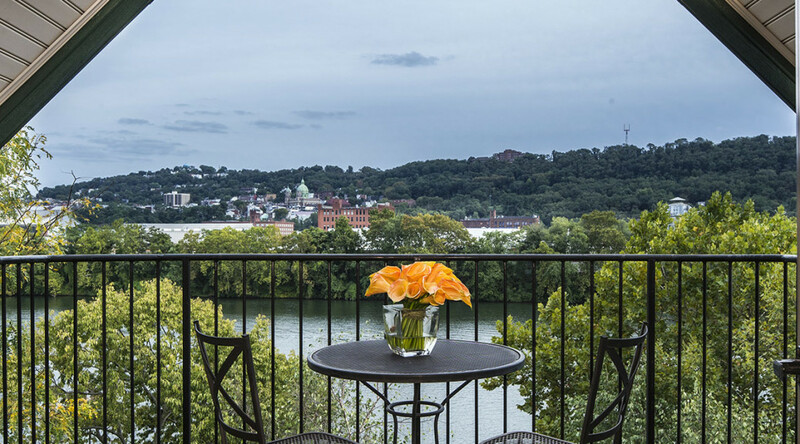 The owners of the home have enjoyed the proximity to both Downtown Pittsburgh and Pittsburgh International Airport. While they welcome retirement, it comes with a move to the Carolinas and the need to say goodbye to their beloved home and the neighborhood they love. 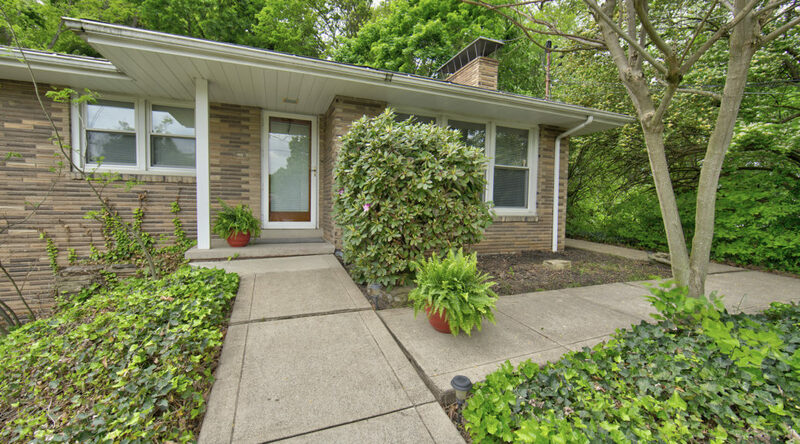 Rosslyn Farms is minutes from I-79, Southpointe, I-376 and I-279. It is a unique community like no other. Neighborhood events including social gatherings, a Fourth of July parade with all-day festivities, wine and cheese parties and a neighborhood book club. It’s an old-fashioned neighborhood where kids happily hang out, building forts, playing ball on the soccer fields and swimming at the Rosslyn Farms pool. 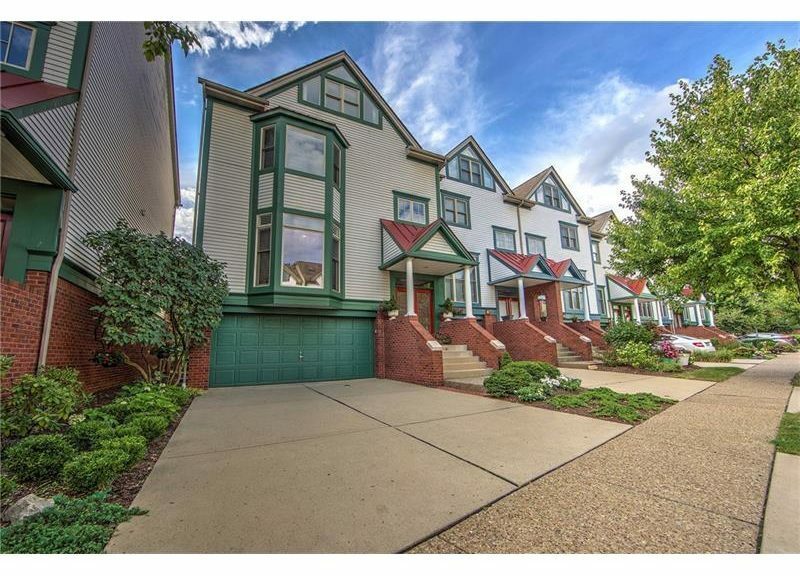 For more information, please contact Maggie Jayson with Select Realty at 412-999-9528 or 724-933-6300 x110. Note: Maggie raised her family and lived in Rosslyn Farms for more than 25 years. “It is a place truly like no other. The magic of Rosslyn Farms will never leave you!” said Jayson. Getting Your Listing Summer Ready! Concierge realtor…so you are looking to put your home on the market? Bring in the professional who will put on the shine, add the lipstick and the true ‘fixes’ to give your home the look. Recently I resurrected a small ranch home. First the executor arranged to have an estate sale. The remainder of contents went to charities and the dump. Next came the professionals to give the home a deep clean. Then the plumber, electrician, and finally the painter. Paint is probably the best remedy for making a home ‘fresh.’ Its worth every penny and then some. I added some furniture including sofa in grey with accent pillows, white birch logs in the fireplace, dining room table with flowering tower. The photographer did his magic. And its show time. Open house. 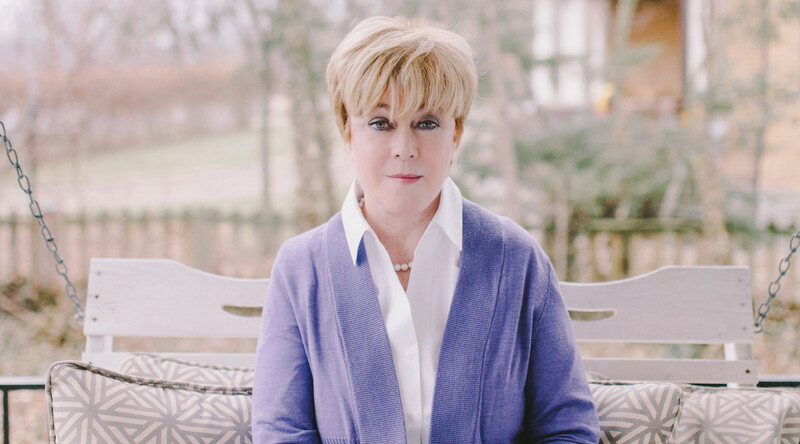 Yes, that’s me…your concierge realtor…Maggie Jayson! 48 Waterfront Drive | Your Summer Home is Here! If that video doesn’t spark your interest, I don’t know what will! Wow! What an incredible home. This exquisite end unit townhouse features an open floor plan with views of the water, rich hardwood floors, gas log fireplace and a panacea of windows opening to a private deck. 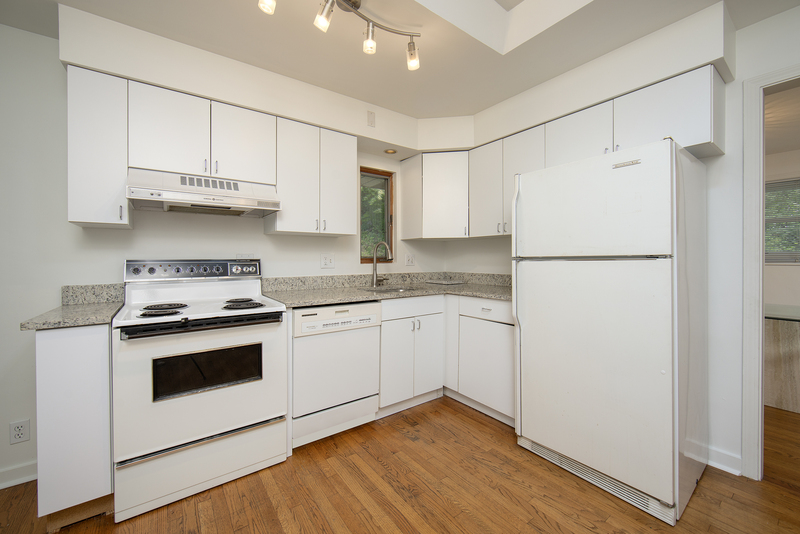 It also features an eat-in kitchen with island, stainless steel appliances, ceramic tile counter tops and artisan backslash. There are four bedrooms including a master en suite. 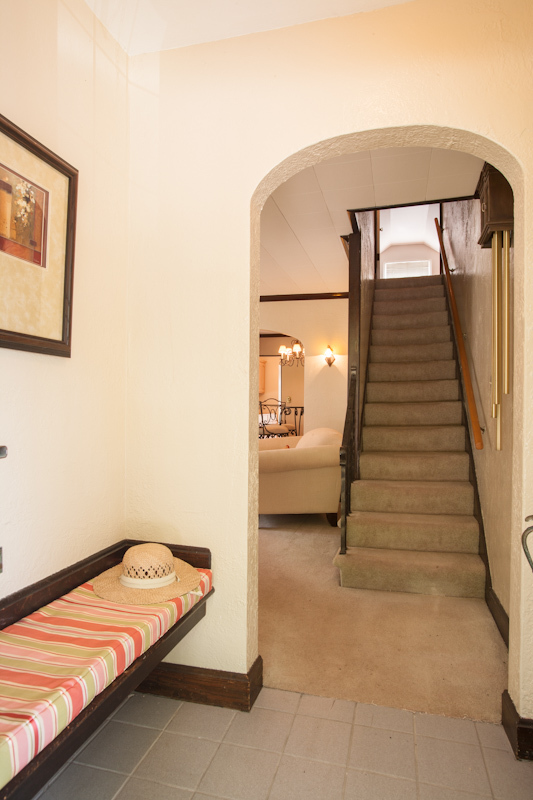 The third floor bedroom can be the perfect mother-in law suite, home office or entertainment center with full bath room. Enjoy a terraced backyard with perennials and a shoreline walkway. The ground floor is finished and makes a great game room. The integral double car garage has plenty of storage space to enjoy all of you hobbies. Enjoy private sidewalks, city lights, waterfront views and downtown access in minutes. 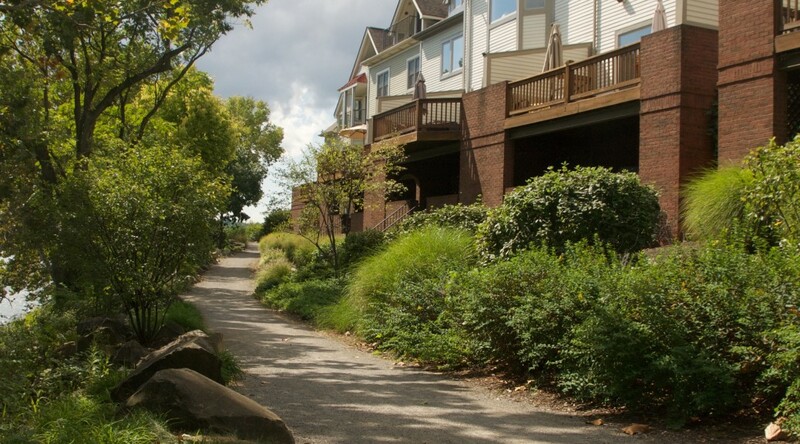 Other features include: Walking/biking trails around the island, onsite marina, Three Rivers Rowing club, Redfin Blues Restaurant, and is close to the University of Pittsburgh, Carnegie Mellon and Duquesne Universities, UPMC and Allegheny Hospitals, Penn Avenue and Pittsburgh’s cultural district. The Pirates season is here. Skip the traffic and take your boat to the game. 6:00 AM Rise & shine. Take the dog out for a morning walk. Enjoy the views of the river along the trail. Quick cup of coffee while perusing the latest TV news. 8:00 AM Hit the road with today’s showing itinerary. Arrive at RE/MAX office and meet new client and her sister. 2:00 PM 15 showings later, I drive back to my office with client and her sister. Talking about her selection and how soon she would like to close. 3:00 PM Off to meet family looking for their first new home. Viewing three selections. Finishing at dusk. 6:00 PM Driving home, looking forward to crashing with my dog, dinner on the sofa with a little TV. Prepping for Sunday open house by the computer. 8:00 PM Conference call with out of town buyer and lender. Respond to emails and texts. Address any concerns before powering down. 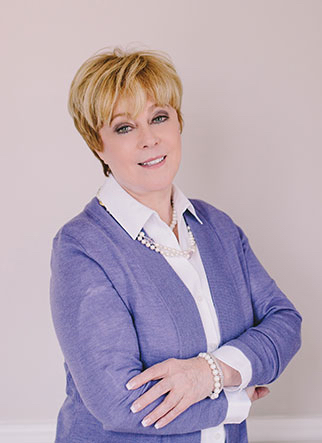 Working as a full time realtor encompasses hours and hours of preparation and attention to detail, setting up itinerary to view homes, assisting clients in making once in a life time decisions. Decisions that will affect them and their dear ones for years to come. I love working with people. Learning about them, making them feel comfortable to rest assured that I will have only their best interest at heart. Helping them network with finding contractors, window washers, insurance carriers, babysitters, new grocery stores, restaurants and best new friends. T’was nine years ago when I stood on the porch of my home on a calm morn awaiting the moving truck. I was alone, scared, teary-eyed, and yes, alone. 29 Priscilla Lane had been my home for over 30 years. I raised my two sons there. That was the only place they ever knew to call ‘home.’ It was a beautiful retreat with over one acre. His name was Don. From that moment on he became a storyteller, a jokester, and endless monologue of life’s journeys. The day was a whirlwind. When we were all packed up I walked out the door and put the past behind. I know I will always have the memories but life moves forward. Houses and property are just that. We cannot get attached to structures. 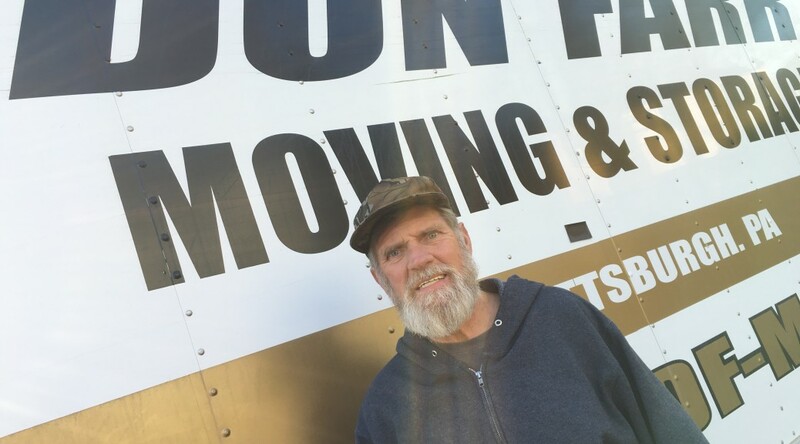 Since that day I have had the pleasure of working with many clients, having Don move them. Some new stories, some edited monologues. Always a delight. Always refreshing. Thank you, Don for having such great insight into the human spirit and your kind words. It’s that first impression that strikes buyers. They walk in that door and either like it or hate it. That is why it is so important to make the first impression lasting. 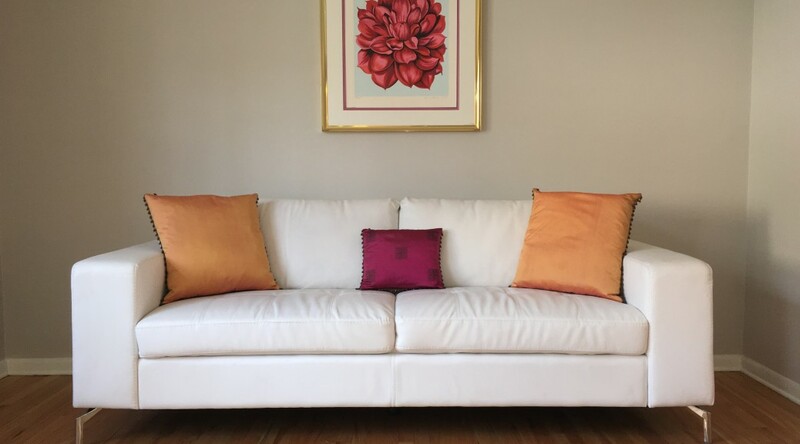 As a seller’s agent I provide complimentary staging. As well as detailed itinerary of possible improvements, repairs to the home prior to listing. Certainly the exterior, landscaping are a must in presentation. And there is nothing better than replacing door hardware. It’s not expensive and makes such a difference. It wasn’t until about a year into selling real estate that I noticed the financial impact staging has on offers. The spring market will be here before we know it. I am offering complimentary staging consults. Shoot me an email and together let’s get your home ready for the biggest selling season of the year! Folks looking to make the transition from their home to a new one must have a clear vision. As a seasoned real estate agent I can assist them in outlining that vision with a detailed path towards reaching their goal. The transition means getting their home on the market all while figuring out where it is they would like to be in the future. I am working with a woman who is looking to move to assisted living in Oakmont. After visiting, we chose a possible housing unit and now it’s time to start the listing process of her home. I am working with another client who would like to downsize from the two story family home to a first floor master. We have outlined her goals and are working to make that happen. It’s an exciting time, sometimes scary, to not know the exact future. As I tell all my clients, never look back with regret. Always look forward to what the future may present. Contact me today to discuss where your future vision is taking you. As a sellers’ realtor, my job is more than putting numbers together, making homes look really really pretty to captivate the buyers’ eye. It is working with the client in achieving their end goal, that of selling their home with nice pricepoint and sending them off on their new journey in good spirits. Not as easy as it appears. I work very diligently toward ensuring my sellers’ pursuits are met. Each client has a different story, a different perspective, and a different end game. It is knowing and translating those entities into tangible outcomes that make my job intense yet truly satisfying. At the closing table I can look at them and know we have attained all those goals, and they are ready to move forward. And that is my reason for being in this business. I so enjoy the satisfaction it brings. As I stated it’s not easy. But at the end of the process I know that I have done my job, done it well, and onward to then next client. I just sold home on Washington’s Landing for a very nice price. Those folks decided to build their dream home on the water in Oakmont. They did an outstanding job in designing it in every detail. The exuberance was definitely evident at the closing table. They are well on their way on their new adventure. Please check out my blog for more stories now and yet to come. 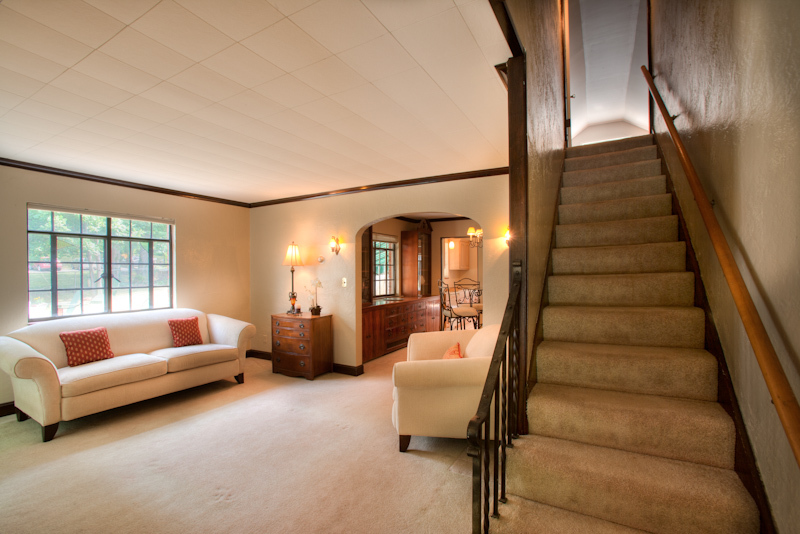 I specialize in creating an atmosphere of warmth & charm when I list & stage a home. Most buyers have a sense about the house when they first walk in the door. So it is of utmost importance to provide an aura of “I love this house!” Using all the senses from visually stimulating artwork to the aroma of the apple pie baking in the oven to soft classical music playing in the background enhances the home. 1204 Powers Run Road, O’Hara Twp. 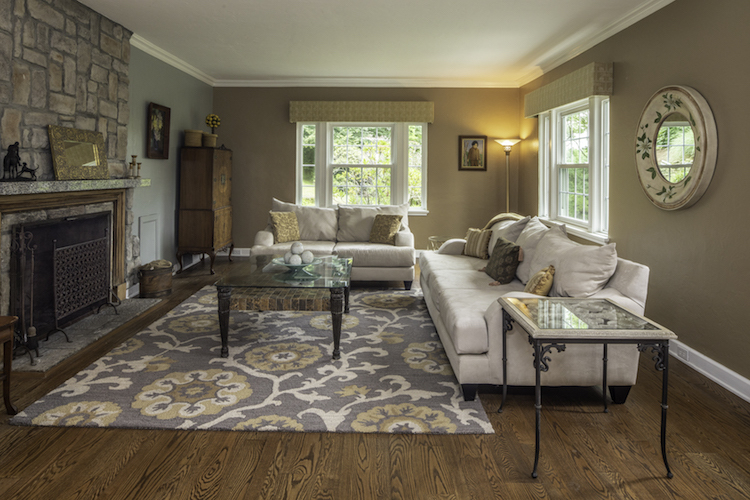 I recently listed and staged 1204 Powers Run Road, a sweet Cape Cod in O’Hara Township. I planted pink impatience along the sidewalk intermingled with hosta. I also placed two large-potted spring mix of flowers on the porch. Just inside the entry way was a wood seat. I enlisted my sister to upholster a pink & green striped growgrain custom cushion, then placed it on the wood bench and adorned it with my mother’s sun hat. I selected a mahogany framed print of colorful flowers from my staging inventory. These simple little vignettes gave a soft and charming presence to the home. 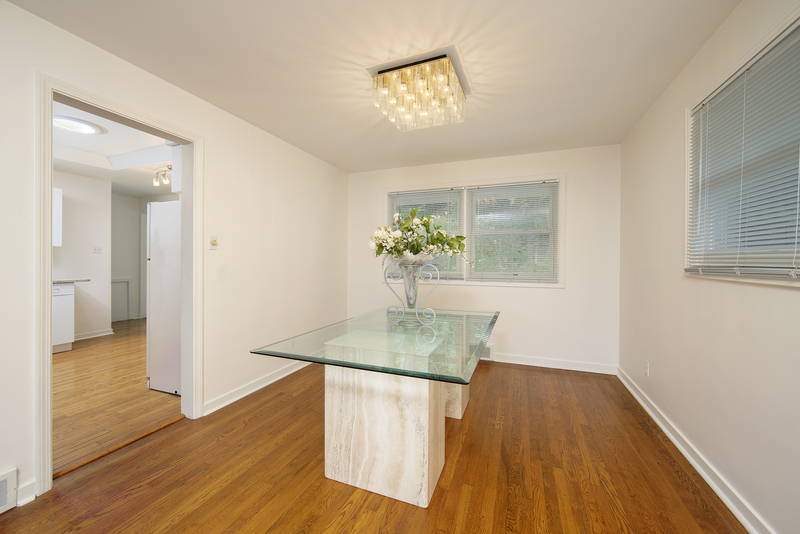 The buyer loved the soft personal touches of the home. She made a full priced offer! Special credit to my talented sister Betsy Tassaro and my stay-out-of-sun fair skinned 94 year young mother, Mary Sterrett. Staging makes such a difference in getting that sale. I provide this service as a courtesy to my clients. This is actually one of my most favorite parts of selling real estate. I work on it meticulously until I am happy with the ‘look’. Yours in gettin’ it sold!